Choosing your next printer can be a daunting prospect but the choice should be based on the cost of replacing the Brother MFC-J4510DW ink as well as the performance of the printer. The running costs of the printer is crucial to its cost effectiveness during its lifetime and should be a major consideration when making this decision. 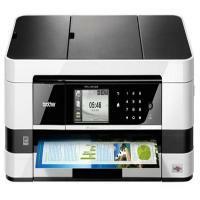 The Brother MFC-J4510DW is a multifunction printer(MFP) for small office and home users. Unlike many other multifunction printers in the market, the Brother MFC-J4510DW offers A3 printing. The other unique feature of this printer is the landscape mode in A4 printing. The device also features Automatic Document Feeder (ADF). Overall, the printer looks quite attractive and smart when compared to other Brother MFPs. This inkjet printer is a great solution for the high volume office work and features printing, scanning, copying, and faxing. The device also has a wireless, USB and Ethernet connectivity. The device can also print from your online photo storage such as Facebook, Flickr and Evernote. The printer weighs approximately 20 pounds but has a compact design. Brother MFC-J4510DW inkjet printer has two input options, one is a tray in front for landscape A4 printing and the other is a slot at back for A3 printing. The landscape mode input also reduces the footprint of the device. The printer also has a touchscreen control panel that eases the task selection. The Brother MFC J4510DW ink will accept both original and non-original ink cartridges. The Brother LC123 ink cartridges come in four colours; black, cyan, magenta and yellow. These cartridges will print equal amounts of pages as either original or compatible inks. The Brother MFC-J4510DW is one of the best choices for office users. The printer features many advanced features that can cope up with massive office work. Landscape A4 and A3 printing also makes it a more attractive to any user. How to replace an ink cartridge? The Brother MFC-J4510DW is an all-in-one inkjet printer. The consumables include Brother MFC-J4510DW ink cartridges. The printer offers good print quality. But at times print related issues are experienced. These may be banded or missing prints, faded prints or no prints. This happen when the ink in the ink cartridges is low or over. The ink cartridges need to be replaced. You can easily replace the used ink cartridges with new Brother MFC-J4510DW ink cartridges by following the steps below. Always use the original cartridges to maintain the good print quality. Open the cartridge cover in the printer. On the LCD screen of the printer, check which ink cartridge needs to be replaced. Keep the required colours of ink cartridges ready to use. On the printer, press the release lever to unlock the ink cartridges that require replacement. Gently remove the cartridges from the socket. Take the new ink cartridges out of the packaging. The new cartridge comes with a protective yellow seal. Turn the green knob on it to release the vacuum. Remove the protective cap from the ink cartridge. It is now ready to use. Place the ink cartridge into the slot in the direction of the arrow that is marked on the ink cartridge. The position of the ink cartridge varies from colour to colour. You have to push the ink cartridge in till you hear a click. This is to ensure that the ink cartridge has been placed correctly. The Brother MFC-J4510DW ink cartridge is now locked into the slot. Close the cover of the cartridge on the printer. Once the above steps have been followed correctly, the printer will reset the ink levels automatically. The printer can be used for printing soon after. If printer shows any kind of cartridge related error check the printer user manual to resolve such issue. Q. What’s the "Breather Tape" on a BROTHER MFC-J4510DW ink cartridge? Is it to be removed or kept on it for installation? A. The breather tape, also known as the shipping tape, is the tape you’ll find on an ink cartridge covering the vent hole on it. Usually it is found at the top of cartridges and is orange or yellow in colour. It has to be removed before installation of cartridges so that the ink inside does not remain vacuum sealed and flows out for printing. If it is not removed, the cartridge won’t print as the ink will remain inside. The tape can be removed by simply pulling it out gently. Q. Do Brother printers like BROTHER MFC-J4510DW print well with compatible cartridges? I’d like to use compatible BROTHER MFC-J4510DW ink cartridges to reduce expenses, but if compatibles aren’t good, it will be a wastage. Please advise. A. The quality and performance of Brother printers and cartridges are well-known. Compatible cartridges of Brother are as good as the originals in every way. They are far more economical, which helps you save a good amount of money. You can go ahead and purchase compatible Brother cartridges and be sure you won’t be disappointed. Q. Is there a possibility of ink cartridges drying up in the printer itself? A. It can happen if an inkjet cartridge is in the printer and is not used to print anything for a long period of time. The ink on the printhead of the cartridge can up and may allow additional ink to pass by, which results in clogging. Q. I was not home yesterday when the BROTHER MFC-J4510DW ink cartridges arrived for delivery. What happens to my product now? A. We attempt delivery of products twice, so one more delivery attempt will be made. (Please note that we deliver from Monday to Friday from 9am to 5pm We hope you’ll be able to collect it the next time around. In case you cannot, your product will be sent back to our warehouses, and you will have to pay delivery charges for sending the consignment again. Q. Is the Brother MFC-J4510DW printer compatible with Windows 8? A. Yes. this printer works well with Windows 8. Q. If one of the Brother MFC-J4510DW ink cartridges get used up, do I have to replace all of them? A. No. They are all individual cartridges. This allows you to save more as you have to replace only the ink that has been run out. Q. How many Brother MFC-J4510DW ink cartridges does the Brother MFC-J4510DW printer uses? A. The printer makes use of 4 Brother MFC-J4510DW ink cartridges and they come in the standard and XXL capacity. Q. Do the Brother MFC-J4510DW printer supports AirPrint feature? A. Yes, this printer supports AirPrint. Q. When I print documents containing images or tables with lines, the lines do not appear straight or are slightly aligned. How to get rid of this? Open the Printing Preferences dialog box. Now, select the Advanced tab. In this tab, click Other Print Options. Select the Vertical Line Alignment function. Finally, select the paper size as your need and click OK.
Q. When I print, the stains appear at the end of the printed/ copied documents. What can I do to remove this? A. Depending on the paper used for printing, there may be stains at the end of the printed/ copied documents. You can improve or reduce this issue either by changing the Density (for copy)/ Colour Density (for print) setting or update your Brother MFC-J4510DW printer firmware to the latest version. To ensure the highest print quality when copying/ printing high-quality documents and photos, it is recommended to set the Quality (for copy)/ Print Quality (for print) to Best and use glossy paper for photos. Q. What exactly is compatible printer ink and will it work in my printer? A.Compatible ink is printer ink that is manufactured by a third party and not by the actual printer manufacturer. There is a considerable difference in price and there are good savings to be made using compatible ink and there is no reason why compatible Brother MFC J4510DW ink will not work in your printer. Q. How long does a delivery of your printer ink take? A.Delivery is by courier and is usually within 1 - 2 working days when the item is in stock. Q. Is there an option to print on both sides on the Brother MFC printers? A. The Brother MFC J4510DW in particular, does have the option of printing double sided as it has a duplex feature. Q. Can I order Brother MFC J4510DW ink from Lisburn? A.Yes you can order from any area in North or South of Ireland. Q. I am worried about using non-Brother inks in my Brother MFC J4510DW printer, will they work? A.The compatible ink cartridges for your Brother MFC J4510DW printer all come with a 100% money-back guarantee, if you have any issues with your cartridges or any enquiries then please contact our customer service department. Q. What are the colours available in BROTHER MFC-J4510DW ink cartridges? A. The BROTHER MFC-J4510DW ink cartridges basically come into four different colours namely black, cyan, magenta and yellow. Q. I need a specific single colour cartridge for my BROTHER MFC-J4510DW printer and not the whole pack. Is it possible to get a single one? A. Yes, you can either opt for a pack of cartridges that contains all four colour cartridges or you can opt for stand-alone too. Check the cartridges listed above to buy any specific colour ink cartridge. Q. The cartridges run out of ink very fast and I need to order it back in a short span of time. Is it possible to get the same in larger quantities? A. BROTHER MFC-J4510DW ink cartridges are available in different quantities depending upon the amount and nature of work for which it is required. If you are a heavy user, you can go for the pack of 20 cartridges that contains 5 cartridges of each colour and if you are a light user you can go for the pack of 4 cartridges. Also, the quantities are chosen by keeping in mind that the ink should not get dry over a span of time. Q. I owe an internet café and have to print some copies for customers. Are compatible BROTHER MFC-J4510DW ink cartridges profitable for me? A. Compatible BROTHER LC123 ink cartridges are basically designed for light users. Because the technology involved makes the process quite expensive for commercial purpose but the print volume justifies all its benefits and utilities. However, you can perform certain other tasks like printing tickets, printing PDF or some other official purpose that doesn’t require bulk printing. Q. Are BROTHER ink cartridges easy to install? A. Yes, it is very easy to install these cartridges. You just need to select from printer screen, the cartridge that you want to replace with new one. Q. Although BROTHER MFC-J4510DW ink cartridges are compatible with my printer, it’s not getting recognised. What to do? A. In case your printer is compatible with this Brother cartridge set, simply reinstalling them will solve the issue. Q. What is the print volume that one can expect from a set of BROTHER MFC-J4510DW ink cartridges? A. The print volume solely depends upon the extent of use. For the heavy user, it might be somewhat less as compared to the lighter users but one can expect an approximate 600 pages of the print volume. For the prints that are more pixelated, they’ll surely demand more ink and may affect the above-mentioned volume up to some extent. Q. How do I know if my printer is compatible with BROTHER LC123 ink cartridges or not? Q. Can these cartridges be used for school projects or education purpose? A. Yes, you can definitely opt for these cartridges for education or any household purpose. Apart fromhousehold purposes, these Brother cartridges are very suitable for printing invitation cards or printing letter heads, restaurant menus. They are a very budget friendly option. Being good at print quality, they are worth every penny spent. Q. What is the ideal number of pages one can print in one day? A. If you are not into any bulk printing, you are good to go with Compatible Brother LC123 - 20 Ink Cartridge Multipack. Ideally, printing 20-40 numbers of pages in the entire day will keep the cartridges good to use.